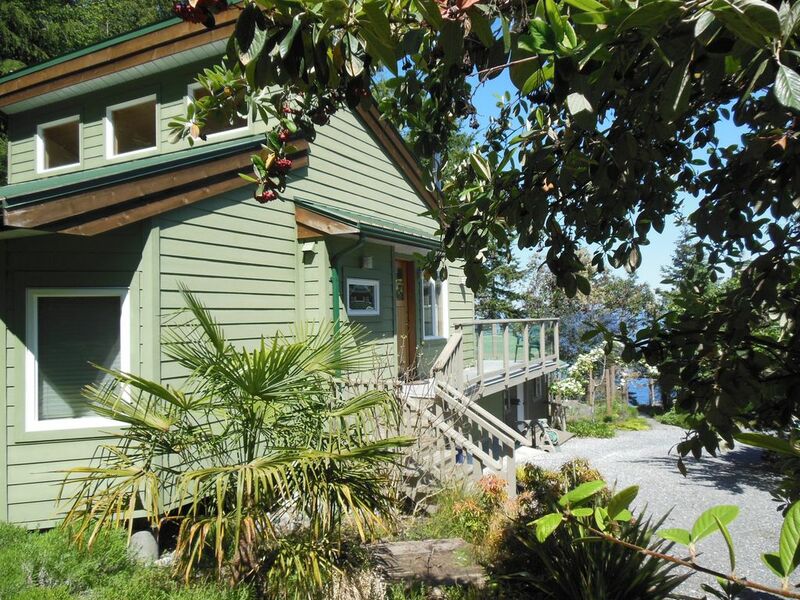 Enjoy your stay at this comfortable and ideally located two bedroom cottage on the spectacular Georgia Strait waterfront of Galiano Island. Designed as a romantic getaway it is set in the garden of a wonderful waterfront property. Walk- on waterfront enables our guests easy access to the shore to explore miles of sandstone beach at low tide from June to September. Seastar Cottage is equipped to the highest standards. It has two Queen size bedrooms, complete bathroom, full kitchen, dishwasher, laundry, sun deck, satellite TV, Wi-Fi. Cellular (mobile) reception is variable.. Relax with a good book or good company on the spacious sun-deck, in the shore side gazebo or in front of the woodstove at night. Spend time watching the amazing wildlife, from whales swimming by, deer strolling along to myriad species of birds (including bald eagles and humming birds). Alternatively you can sea kayak, charter fishing boats, take advantage of many beautiful hikes or visit the many arts & craft studios around the island. The owners, who live at the main house on the property, will be glad to give you information about Galiano Island. The cottage is 15' away by car from the ferry terminal. The Humming Bird Pub, an organic food store and a corner store are at less than 10' away driving from the cottage. Galiano has a surprising variety of restaurants. Close to the ferry terminal you will find a great book store, a Spa, the Post Office and another grocery store/gas station . NOTE FOR CANADIAN GUESTS: VRBO post the rates in US$. Maria Carmita is a Spanish language teacher and George is a retired engineer that live full time in Galiano Island. They both love gardening and the natural beauty of the flora and fauna of the island. They will be here to greet you and share their local knowledge and help you make the most of your stay. They can help you with reservations for dinner and a variety of activities. We love Galiano Island because even though it is the closest to Vancouver among the Gulf Islands, it still feels like a wild place. When we saw this property we decided to move from Vancouver to Galiano. This property has it all, the sea in front of our windows, a sunny orchard, privacy and a long flat rural road to walk up to heritage forests.We live in the main house and we have the cottage for guests and friends. Modern bathroom, with bathtub and shower, a sink cabinet, toilet, mirror and electric baseboard. Love seat and two armchairs, coffee table and area carpet. Coffee, tea,sugar, spices, condiments, napkins. I took a mini break, and was hoping for (and found) peace, privacy, and some beautiful time in nature. The cottage was picture perfect. Thank you to Maria Carmita and George for your warmth and hospitality. Loved my first visit to Galiano. I look look forward to returning. Beautiful long weekend at the Seastar Cottage! Four of us stayed at the Seastar cottage and really enjoyed ourselves. The hospitality was wonderful, and the cottage was very clean and comfortable. It made our weekend on Galiano Island very enjoyable for us and our guests visiting from Ontario. The beautiful waterfront with its natural shoreline provided some tranquil sunset views which we could enjoy from the patio and gazebo. I would highly recommend for a peaceful stay that is close to Sturdies Bay and other island amenities. Lovely hostess and host, beautiful setting. We had a great time. We loved being on the water and watching the boats go by. It was clean and tidy with plenty of room for the 4 of us, adults. We kayaked and enjoyed several viewpoints. The bakery was an added bonus as was the farmers market. The cottage is easy to get to and great for quiet afternoons and evenings . We would definitely, go again. We had a lovely stay at the Seastar cottage! Definitely would recommend. We thoroughly enjoyed our stay in this wonderful rental home. It was so comfortable, clean and well-appointed with everything we needed. The ocean views from the living and dining areas, the deck and the gazebo were an extra bonus. There is so much to do on Galiano. The hike up Mount Galiano nets the best view of the Gulf Islands we have ever seen - well worth the climb - and we loved the kayaking and wandering through the local shops, but it was always so nice to come back and relax at the Seastar cottage to play games, make meals and head down to the gazebo to watch the sunset. Thank you Maria and George for such a lovely stay!! We are on the south part of Galiano where most of the island activities are located. It is possible to rent Smart Cars, Scooters, Kayaks and Boats on the island. Galiano has a wonderful bookstore and library. Many artists open their studies to the public. The Saturday Market is great fun. There are several restaurants to enjoy good food. There is a Health Care Clinic on the island with a full time doctor and nurses. RENTAL STANDARDS 1. Smoking is NOT allowed on the property. 2. People other than those in the Guest party set forth above must not stay overnight in the property. Any other person in the property is the sole responsibility of Guest. 3. The homeowners are not responsible for any accidents, injuries or illness that occurs while on the premises or its facilities. The Homeowners are not responsible for the loss of personal belongings or valuables of the guest. By accepting this reservation, it is agreed that all guests are expressly assuming the risk of any harm arising from their use of the premises or others whom they invite to use the premise. 4. HOUSEKEEPING: There is no daily housekeeping service. While linens and bath towels are included in the unit, daily maid service is not included in the rental rate 5. Meals are to be taken at the kitchen or deck tables but please not while on the sofas in the living room. 6. FIREPLACE: The fireplace is a wood burning stove. Please do not throw any garbage in the wood burning stove other than non- glossy paper. 7. BBQ: We have provided a propane BBQ for your enjoyment please use due care when using. Under no circumstances should the BBQ be brought inside. 8. WATER AND SEPTIC: The property is on a well and septic systems. The septic system is very effective; however, it will clog up if improper material is flushed. DO NOT FLUSH anything other than toilet paper. No feminine products should be flushed at anytime. WATER SUPPLY: Please note that during the hot summer months due care to water usage is required. Please keep showers short and don't let taps run unnecessarily. Galiano Island along with the rest of the gulf islands are in a constant state of drought. 9. AGE: minimum age of “Guest" must be 21 years of age 10. Check in time: 3 pm Check out time: 11 am DEPARTURE DAY CLEANING CHECKLIST Please, before leaving place all dishes and cutlery in the dishwasher.